The Trump Jr. Affair: Who Is Russian Lawyer Natalia Veselnitskaya? Those in attendance of the meeting besides Trump Jr. included — Paul Manafort, President Trump’s campaign manager at the time, and Jared Kushner, President Trump’s son-in-law and current advisor according to The Times. The person who set up the meeting was Rob Goldstone, a music publicist and personal friend of Trump Jr.
Members of the president’s legal team have identified Goldstone as the acquaintance “who sought the meeting is associated with Fusion GPS,” according to a report by Circa News. Viewing Vaselnitskaya’s Instagram and Facebook it becomes apparent she is heavily anti-Trump and anti-Putin, so why would she claim she has evidence to help Trump from the Kremlin? It becomes quickly obvious that something is not right and does not add up. Veselnitskaya even posted an anti-Trump article on her Facebook page four days prior to her meeting with Donald Trump Jr. on June 9th. So was she a plant to sell the “Russia hacked the election” narrative? Full archive of Veselnitskaya’s Facebook can be seen here. The article she posted was entitled “NY Attorney General: Trump University Is a Straight Up Fraud Case (Video)” regarding the investigation into Trump University for fraud. Here’s where things get weird and what the mainstream media is refusing to talk about. Not only is she adamantly anti-Trump but she is coincidentally connected to Fusion GPS – the same firm that former MI6 Christopher Steele was employed by to collect information on then-candidate Donald Trump. According to Veselnitskaya’s affidavit filed in New York in January 2016, she managed to get “special permission” to enter the United States after having been denied a visa. Her company, Kamerton Consulting, defended Denis Katsyv, representing his company Prevezon Holdings. The actual date of the hearing in the case U.S. v. Prevezon Holdings was the exact same date as the meeting in Trump Tower — June 9th 2016. Prevezon Holdings is a beneficiary of Fusion GPS, reported Circa News. Katsyv is the son of a vice president of state-owned Russian Railways who was charged with money laundering in the United States over a case tied to an alleged massive Russian tax fraud scheme. That case was settled in New York in May for $6 million dollars. Veselnitskaya has for several years been leading a campaign to have the Magnitsky Act overturned by the U.S. government – an Act that was established after Sergei Magnitsky a lawyer with investment advisory Hermitage Capital died in prison. Magnitsky uncovered the alleged $230 million dollar Russian tax fraud scheme. As part of her effort she allegedly hired GPS Fusion. A complaint filed last year by Senator Chuck Grassley claimed that Fusion GPS headed a pro-Russia campaign to kill the Magnitsky Act. Veselnitskaya also denied claims that she spoke about any matters regarding the presidential campaign at the meeting. “Nothing at all about the presidential campaign [was discussed at the meeting. I have] never acted on behalf of the Russian government never discussed any of these matters with any representative of the Russian government.” Veselnitskaya told The New York Times. Kamerton Consulting, is based in a Moscow suburb and does not even have a website, which begs the question is it a shell company? 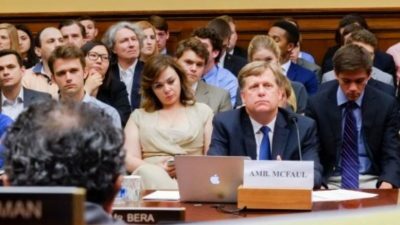 It’s has also been reported that Veselnitskaya was seen sitting next to Obama’s Ambassador to Russia, Michael McFaul, during a Foreign Affairs Committee hearing on Russia and the Ukraine that took place on June 14, 2016, 8 days after meeting Trump Jr.
She also helped set up an event at the Newseum in Washington, D.C. where pro-Russian supporters showed a movie that challenged the Magnitsky Act. Then there is the fact that Obama’s Justice Department at the behest of Loretta Lynch allowed Veselnitskaya into the U.S. right before the meeting at Trump Tower. The question on everyone’s mind now is, Who is Natalia Veselnitskaya and why was she seated at a committee hearing on Russia and the Ukraine? Only time will bring more answers to who this woman really is.